The Domino Inspired My Home Contest Entry: Kate C. | Keep Domino Alive! The Domino Inspired My Home Contest Entry: Kate C.
I am a 24 year old fashion stylist living in Washington, D.C. I also co-write the blog Style Redux on fashion and interior design. Beth, who has been doing the series Domino’s Icons of Style for this blog, is my Mom. I moved into my first apartment when I graduated from college in May of 2007. I wanted my first place to reflect my sense of style, but on a limited budget. As a Charter subscriber to Domino, I was constantly inspired by their attention to great style, not big price tags and big name designers. Their rooms were chic, young, modern, and achievable. My dining room has 10 foot ceilings, great light, and beautiful views of Georgetown. I did not want the furnishings to compete with the space. 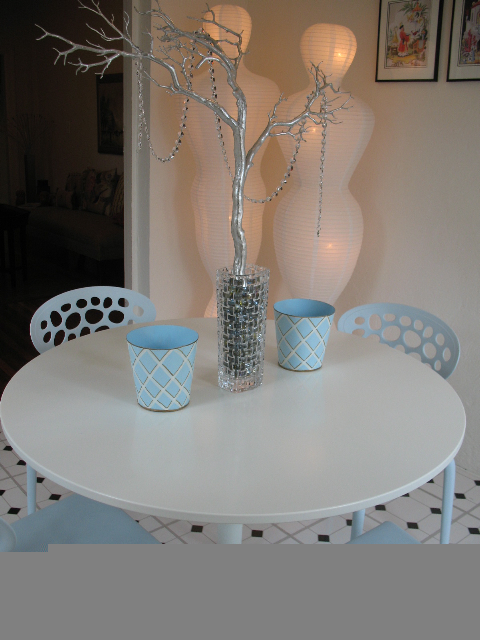 These three photos from Domino served as inspiration for my dining room. In the October 2005 issue, I was taken by the Saarinen tulip table, pale pink palette, and a the minimalist yet dramatic approach. The second photo that inspired this room, shown above from the June 2006 issue, here again the light palette and embracing of negative space. 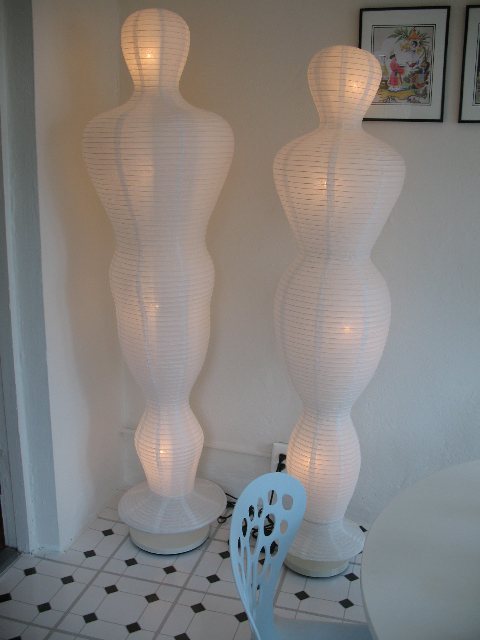 The piece of inspiration came from the August 2007 issue, showing a gorgeous paper lantern by Isamu Noguchi. I also liked the use of round tables, which to me is much more Zen and inviting. I tried to incorporate these concepts in my dining room. 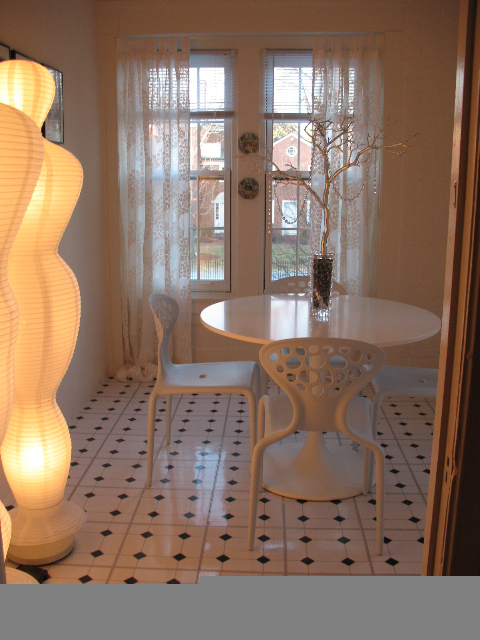 The paper lantern floor lamps from Ikea on sale for $20 pay homage to Noguchi. I used the floor lamps because with a concrete ceiling I could not center a chandelier over the table. The male and female forms are chic and dramatic. 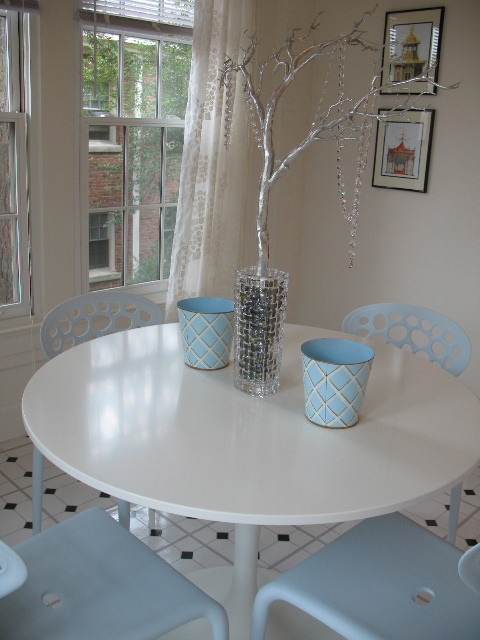 The table is a knock off of the Knoll Saarinen tulip table at Ikea for about $100. These wonderful pale blue supernatural chairs keep my pale and airy palette, and the holes let you see right through them. They are indoor/outdoor, so down the road I could use them on a balcony or patio. They were designed by Ross Lovegrove for Moroso. When light passes through the holes, it creates gorgeous shadows. They are easily found online and come in an array of colors. 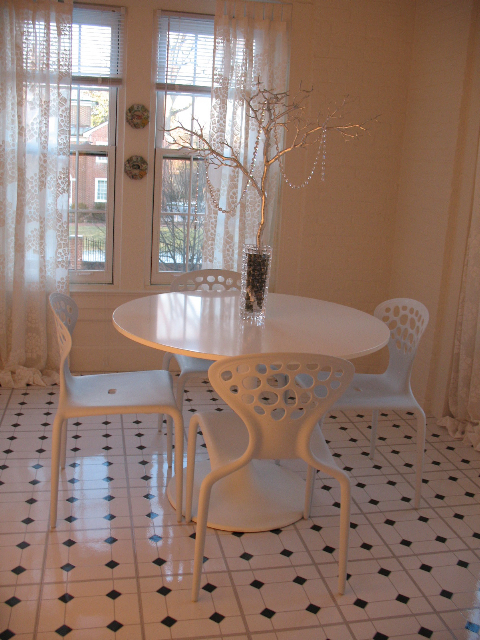 The white linen sheers from Ikea are light and airy and pick up the circle pattern in the chairs. I hope you like this room; I think it has a very serene and ethereal quality. It is a wonderful place to have a morning cup of tea and watch the city wake up, or to order in a dinner of Thai food with friends. Love those little blue lattice patterned tins- where did you find them? those chairs are wonderful. great idea for a blog, i miss domino so much it hurts. Your room looks clean and light. I think it’s very inviting and stylish. I could imagine visiting at that table and being very comfortable. Great job. I didn’t know so many people missed this magazine, I have all of mine saved. I like your room much better than the inspiration room. The chair backs and curtains together give a lift to the spirit. DOMINO magazines are some of my prized possessions. I caught my kiddo using one as a coaster and it was not pretty…..WHY did Domino go away?????!!!!!!!?????????????? love the room – have a question ………….. i have the lamps & am looking for replacement paper lamp shades ……… can anyone out there help ??? ?